Ald. Cicely Fleming (9th) listens during an Evanston City Council meeting. 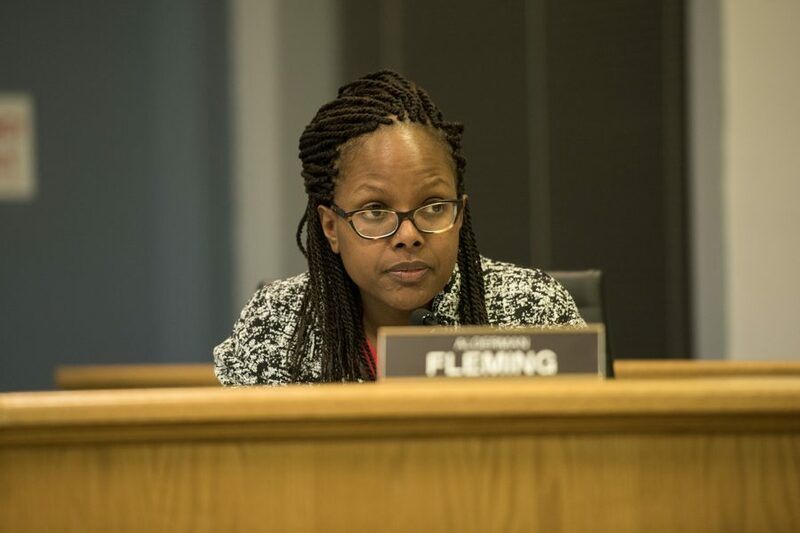 Fleming said she wanted the city to split the revenue from the proposed real estate transfer tax between the city’s general fund and the affordable housing fund. Aldermen approved a resolution 6-2 to place the proposed real estate transfer tax increase on the ballot in November at a Monday meeting. City Council previously discussed increasing the real estate transfer tax at a July 23 meeting in an effort to increase revenue for the city. The tax, which individuals selling property in Evanston must pay, has a current rate of $5 per thousand. According to city documents, the proposed increase of the transfer tax would only apply to properties listed at over $1.5 million. The proposal dictates an increase of $5 per thousand to $7 per thousand for properties between $1.5 million and $5 million. Additionally, the proposal increases the transfer tax for all properties sold for over $5 million, from $5 per thousand to $9 per thousand. All properties sold under $1.5 million will stay at the current transfer tax rate. The extra revenue from the transfer tax increase, if passed, will go directly to the city’s general fund. During public comment, some Evanston residents with Reclaim Evanston — an organization dedicated to fighting for economic, racial and gender equality — said they agreed with the proposal, but wanted to amend the referendum so that the money collected goes to Evanston’s affordable housing fund instead of the general fund. Evanston resident Doug Sharp, a member of Reclaim Evanston, said he believes more affordable housing is needed in Evanston and that the city should return to its commitment of affordable housing. Ald. Cicely Fleming (9th) tried to amend the resolution during the City Council meeting to have the proceeds from the real estate transfer tax proposal be split evenly between the city’s general fund and the city’s affordable housing fund. However, Michelle Masoncup, the city’s corporation counsel, said that the council could not change the distribution of the proceeds of the transfer tax from the city’s general fund because it differed from the public notice of the referendum in the Chicago Tribune. Masoncup said City Council could introduce a resolution at a later date that changes the “dedicated funding source,” but the wording would remain the same on the ballot, indicating all revenue from the tax will go toward the city’s general fund. Ald. Ann Rainey (8th) said she supported Fleming’s amendment and wanted to make it clear that she was dedicated to changing the language of the transfer tax to include the affordable housing fund as one of the recipients of the revenue from the tax. “We are committed to co-sponsoring a motion at whatever time is appropriate that we support splitting the funds between the general fund and the affordable housing fund,” Rainey said.